Through various grants and contracts, the Nevada Field Office conducts radiological monitoring activities at and near the NNSS Environmental media monitored by the Nevada Field Office include water, air, plants, and animals. Monitoring results are reported on a yearly basis in the NNSS Environmental Report. Radiological monitoring of water to detect radiation contamination from past underground nuclear testing at the NNSS is performed on a routine basis. Water samples are collected from on-site and off-site groundwater wells, public water supply systems, and natural springs. On-site water quality monitoring is also performed to ensure drinking water and wastewater on the NNSS meet all the applicable water quality standards and permit requirements. This is reported in the NNSS Environmental Report. Continuous air monitoring is conducted at the NNSS to determine the levels of airborne radiation emitted from the NNSS to demonstrate compliance with federal regulatory limits established to protect the public from harmful levels of man-made radiation. Monitoring results are also needed to verify that radioactive and non-radioactive air emissions from the NNSS remain below the federal Clean Air Act emission standards and within limits specified by air quality permits. 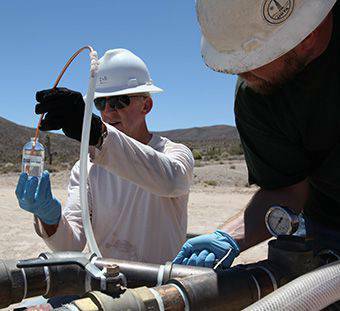 The Nevada Field Office monitoring program evaluates the radiological dose to plants and animals on the NNSS, which may be exposed to radiation from past or present site operations. Field collections of plants and animals, and analysis of their tissues for radionuclides, are performed routinely. The methods and results of NNSS plant and animal dose evaluation activities can be found in the most currently published NNSS Environmental Report. In addition to these monitoring activities, the CEMP conducts monitoring activities in communities near the NNSS. The CEMP is an independent organization made up of community residents. This program provides independent monitoring at off-site locations and engages the public hands-on in monitoring environmental conditions in their communities relative to activities at the NNSS.